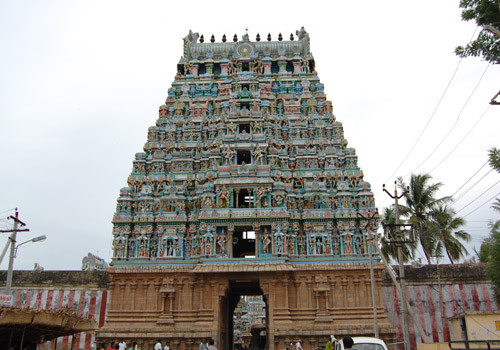 Patteeswam Durga Temple is located in Patteeswaram near Kumbakonam and its dedicated to Goddess Durga. In this temple Goddess durga appears in very soft and grace looks (Shanta Swarupi), sitting on her vehicle lion, placing her feet on the head of Demon Mahishasura and Goddess Durga seems in Tribanga (three curved) posture , eight hands, three eyes and Jewells in ears. Rahu and Mars are the responsible for struggles in life like delay in marriage, business problem and etc. To be rid of these struggles in life, offering a saree , garlanding lemon fruits, lighting ghee-lamps and Kumkum to goddess durga in this temple, would serve and obtain great results. Goddess Durga - People afflicted with Rahu and kethu Doshas worship at this temple during Rahu kalam. It is believed that during Rahu Kalam, Rahu worship the Goddess every day. Worshiping Goddess Durga on Tuesdays, Fridays , Sundays and in particular, on new moon, full moon, Ashtami and Navami days is consider very Special. Lord Bhairava - Worshiping Lord Bhairava in this Temple give relief from the enemy threats and cure from any illness. Lord Patteeswara - Worshipping Lord Patteeswara in this Temple give relief from worries,Gives job opportunities, progress in trade and promotions in jobs. Templefolks.com is not a temple agent. We will do pooja on your behalf to offer and deliver Prasad to your home. The amount will be used to buy and provide Prasad from the temple. And, to awning all assorted costs such as Covering, Shipping and also includes all government taxes. Normally it takes 7 days you to receive this prasadam from temple, if you are outside India it takes 15 days to receive your prasadam.